Why Buy Holiday Wristbands from Amazing Wristbands? Holiday wristbands are the perfect way to keep the fun of different holidays going all year round. All wristbands from AmazingWristbands.com are made of comfortable, latex-free, and non-allergenic silicone. Best of all, your holiday bracelets can be customized with your own personalized message. Christmas Wristbands: Special Christmas bands can be used as gifts, giveaways at parties, or promotional items. Added to our usual standard size silicone wristbands, we also offer 1" wide Christmas bands and 1" wide Christmas slap bands. 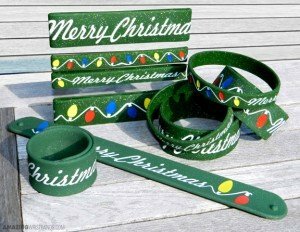 Custom Christmas bands can have any message you choose with variety of styles includes glow in the dark, glitter, color filled and deboss. New Year's Wristbands: Use New Year's Wristbands as party wristbands or as motivational wristbands to stay committed to your New Year's resolution. Halloween Wristbands: Custom Halloween wristbands are a great alternative to handing out candy. Halloween party bracelets can be popular giveaways for kids and adults alike. St. Patrick's Day Wristbands: Create custom wristbands with our green silicone bracelets to make sure everyone at your party is wearing green on this special day. Print fun Irish sayings such as "Luck O' the Irish" or "Erin Go Bragh" on your green party bracelets. Party Wristbands: Custom silicone wristbands can work for any celebration. Festival wristbands help remind party-goers of how much fun they had long after the party is over. **Get all 3 (1 of each) Christmas Bands for just $10!** . 1-Jan New Year's Day Use New Year's wristbands to celebrate the new year, provide motivation for resolutions, and promote safe driving after New Year's Eve parties. Specific New Year's events also use wristbands. 14-Feb Valentine's Day Create your own custom Valentine's Day wristbands to share a special message with your loved ones. Valentine's bracelets are also a great alternative to candy as classroom giveaways. 2nd Sunday in May Mother's Day Let mom know how special she is with custom Mother's Day wristbands. Imprint a special message, or the names of all the mom's kids as a reminder of how important she is to your family. 3rd Sunday in June Father's Day Father's Day wristbands can have custom messages to let dad know what he means to you. Use artwork to represent dad's hobbies or interests. 4-Jul Independence Day Red, white and blue wristbands can help you celebrate Independence Day! Great for local events, family parties, or just to let everyone know how much you love the USA. Last Sunday in July Parent's Day And International Children's Day. Wristbands for Parent's Day and Children's day can spread awareness of the importance of caring for children and protecting families. First Monday in September Labor Day Use custom Labor Day wristbands to celebrate the achievements of workers and the labor movement or to say goodbye to summer. 31-Oct Halloween Day Orange and black, fall-themed, or glow-in-the-dark wristbands with custom messages help celebrate Halloween. Halloween bracelets are also a great alternative to candy for trick-or-treaters. Fourth Thursday in November Thanksgiving Day Thanksgiving wristbands in traditional fall-themed colors can help us celebrate the season. Writable wristbands give everyone the opportunity to write down what they're thankful for and share it with others. 1-Dec World AIDS Day Wristbands commemorating World AIDS Day, observed on 1 December every year, can improve awareness about the prevention of AIDS and the importance of people knowing their HIV status. 25-Dec Christmas Christmas wristbands make excellent and inexpensive gifts. 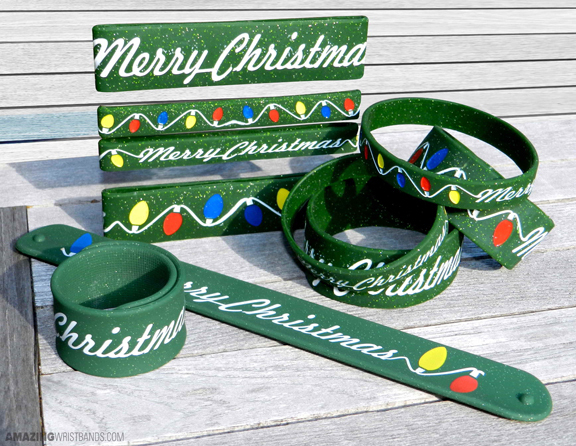 Use Christmas wristbands to spread good cheer during the holiday season. Customize your Christmas bracelets with red and green coloring, glitter and fun artwork. 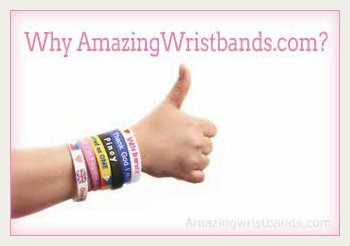 Amazing Wristbands is a leading provider of customized silicone bracelets available online, including holiday wristbands. Our products include your personalized message, desired artworks and color. We offer a wide variety of types and colors to help your party bands stand out and make a difference. 100% Silicone Wristbands for your holiday party. FREE Shipping for holiday wristbands in the U.S.
FREE artwork and design for your holiday wristbands. FREE Color Matching – choose from one of our many other colors! Get a detailed quote for your order in minutes!